At my happiest pottering in the kitchen, I can't say I rely on ready meals in any way. But I do keep a keen eye on food industry and shopping trends for working life and there is no denying the huge demand for prepared food. Increasing time poor and with the whole family working, it's sometimes just not do-able to get a slow-cooked meal on the table every night. And as a working parent myself, I can now totally sympathise! 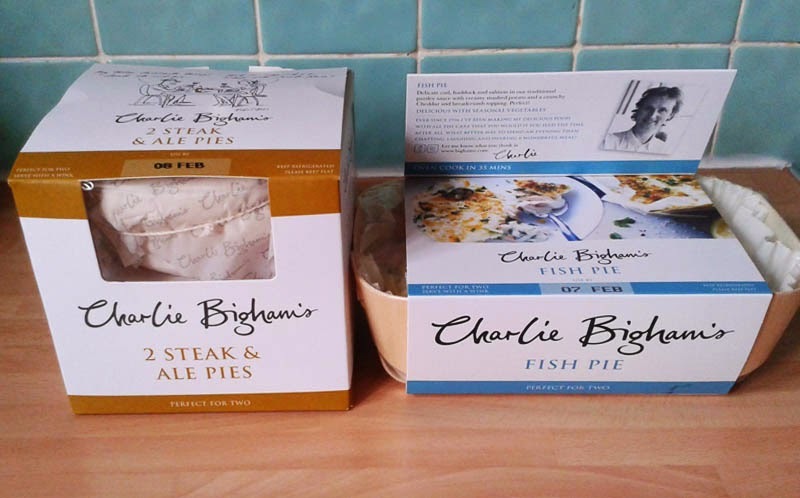 Charlie Bigham products definitely have shelf appeal in the ready meal aisle. The crisp white packaging and nicely crafted script writing pings out from the sea of brown, red and green. 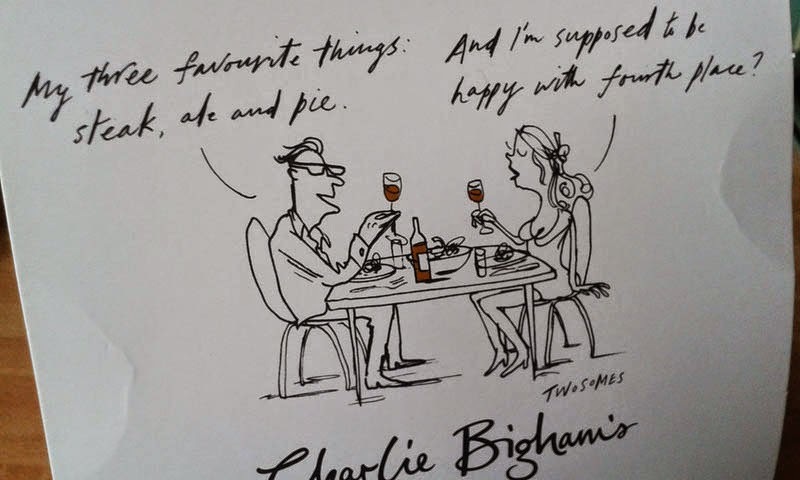 The illustrations are fun but very broadsheet in tone and a nice touch that each range has it's own joke between the characters. And let's face it, everyone has a peek under the sleeve of prepared food. 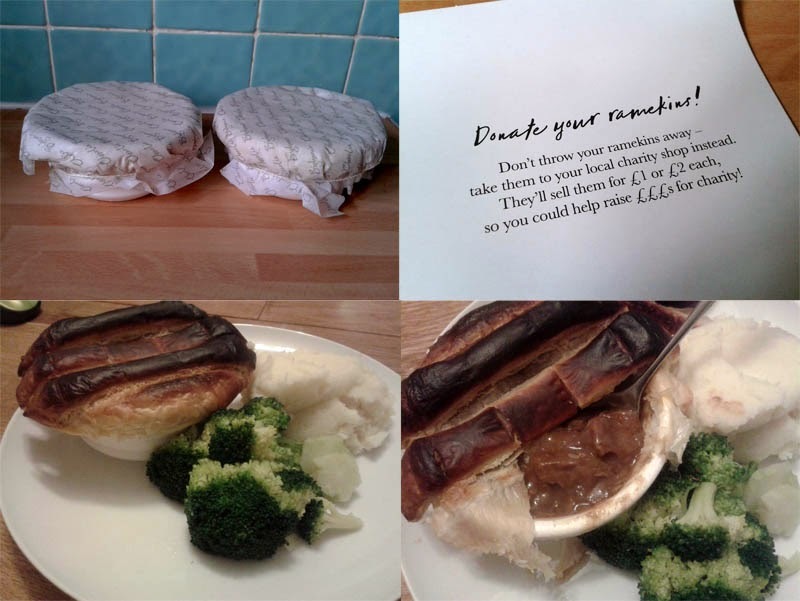 Normally you are met with a brown, lumpy mush but CB have gone one step further in the presentation stakes with oven-safe wooden trays for the meals and ceramic ramekins for the pies, that are also topped with branded paper tied with string. A bonus as well is that all of this is a darn sight more environmentally conscious than piles of plastic trays. So yes, if you could specifically brand a ready meal for the middle classes, then this hits the nail firmly and squarely on the head. Price-wise they are amongst the top end of the ready meal sector at £7 for a meal for two. But to me I find that a little reassuring. There are more quality questions raised with a ready Chicken Korma that can be sold for £1.20. But looks aren't everything. Are these really going to make me down my kitchen knives? First up was the fish pie. It looked great and was very well made with plenty of chunks of fish salmon and white fish. To be fair, I was surprisingly impressed with it. It tasted like a very, very good homemade fish pie both texturally and visually. As I may not use too much butter and cream in my everyday cooking, this was richer and felt like a treat. 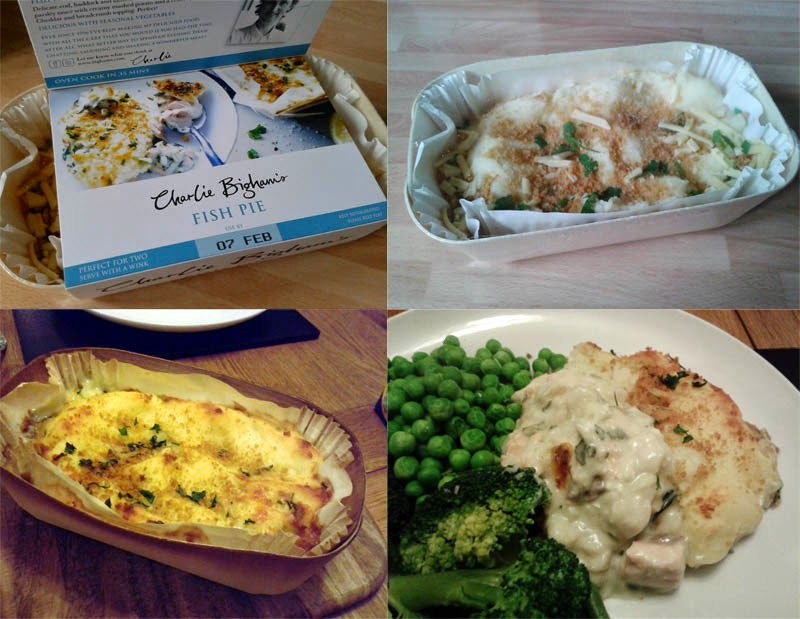 Looking at the ingredients, there was nothing that you wouldn't put in a fish pie yourself and the addition of breadcrumbs and fresh parsley on top helped it feel hand crafted. I'd be more than happy to eat this one again. The Steak and Ale pies looked the part in their ramekins. Unfortunately I left Mr. GF to cook them (oven. 30 mins) but they seemed to have become a tad singed in his care. It had been a hard week for him - clearly. Now I'm not one for a pie like this normally. I find flaky puff pastry more irritating to eat than anything. Underneath though there were generous hunks of tender meat in a rich gravy. For me though, the gravy was too intense, too much ale resulting in the filling being quite one dimensional. I like a bit of variety in there, more vegetables and more vibrant flavours. The quality of the pie however, couldn't be argued with. Maybe I'd be better off with one of the other varieties personally, as this was more to the husband's taste. All in all though I was left with a new respect for quality prepared food. The fish pie was just gorgeous. Why can't all prepared food taste like this? (Production and consumer demand for cheap, cheapy, Mc cheap food is the answer, I know!) I suppose it's good to know brands like this do exist. Maybe for a more niche, affluent market but clearly there's one out there. I was sent these products for review.